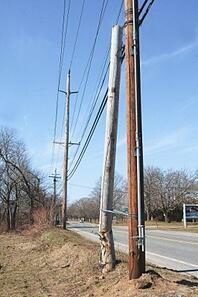 While many unexpected issues can be discovered during utility pole inspections, among the most common is double wood. For whatever reason—incomplete pole transfers, where you have two poles where there should only be one, is not a problem you need on your mounting to-do list. There are a few good reasons for this and some may not be as obvious as you think. The most prevalent and perhaps the best understood reason that double wood can be damaging, relates to financial liability. To tell this story, let us start with what happens when a pole slated for removal has not been relieved of duty due to an incomplete transfer request or because the old pole has simply slipped through the cracks. When attachments are involved and attachers are the slow-down, ownership may be transferred to the lagging attacher. In other instances, the pole may simply remain under original ownership. Regardless, whoever owns the pole also owns the responsibility and assumes liability should it fall, become an impediment to pedestrians or traffic, present itself as a magnet for climb-hungry urban explorers or ultimately cause damage to life or property. We probably do not have to mention how expensive this issue can become—much more expensive than leveraging a field visit to identify where double wood exists and complete the transfers. Beyond financial liability, double wood can also impact organizations in other surprising ways. Say you are an attacher who wants to expand your fiber network. You have been busy. So busy that you have become delinquent in moving your equipment from another owner's poles. Perhaps you have ended up owning a few poles, but beyond that, you have also ended up earning a reputation. Because of this, when making your own requests to attach and expand your network, those previously snubbed pole owners have the right to deny access until the transfer work is complete. In this case, your bottom line suffers, albeit indirectly. Good relationships with joint use partners may be damaged by double poles. The public is a force to be reckoned with and utility poles sit in plain view of a watchful citizenry at all times. As a pole owner, neglecting to remove double wood is a highly visible issue—one that has the potential to evoke the wrath of homeowners desiring unobstructed views, developers wanting to sell pristine properties and city councils looking to improve pedestrian friendliness. Nobody sets out to create enemies, but overlooking this unconventional ramification of double wood can indirectly create a few. Get out and see the sights for yourself. Regular field assessments and integrated data collection via a smart joint use solution ensures double wood isn’t creating a blind spot in your business’s relationships, public relations, or bottom line.